Built in 1961, Chungking Mansions on Nathan Road in Tsim Sha Tsui is probably one of the best-known buildings in Hong Kong. Despite the building’s fame, little has been written about its developer – a Filipino Chinese businessman by the name of Jaime Chua Tiampo. This article is an attempt to piece together the story of him and his family based on various sources. Left: The Tiampo Building in Iloilo today; right: letter mailed in 1943 by Jaime Chua Tiampo from Japanese occupied Hong Kong (address listed as 9 Cumberland Road in Kowloon Tong) to a Father Ryan of the Catholic Church in Kweilin to pass to a Mr. Cai Ren-shou. Jaime Chua Tiampo was born in the turn of the century (one article mentioned 1900 although his Philippines marriage records listed 1898 as his year of birth and his Canadian death record showed 1901) in the village of Pengtian in Fujian province. At a young age (one article mentions 9 years old although another article cites 1912-1914 which would have made him a teenager), he migrated with an uncle to the Philippines where he was taught Spanish and English by Father Mathias Boonen, a Catholic priest with the Mill Hill missionaries. With Boonen as his mentor, he was converted to Catholicism and baptized in 1922, adopting the Christian name of Jaime Chua Tiampo (while his Chinese surname is Chua, his family would adopt his given name Tiampo as their English surname). In 1925, he met and married Josefina Co (1905-1979), who came from a family established in the cargo shipping business and who converted to Catholicism to marry him. Their eldest child Helen was born in December of the same year and over time the couple had six more children. Jaime and Josefina built their fortune in Iloilo, which was a prosperous region under American rule in central Philippines in the early 20th century with the first movie theater and department store in the nation. Jaime owned vessels including a lorcha called Cataluna which sank in 1930 after it collided with a motorship called Tai Yin. In the early 1930s, he and his wife developed the Tiampo Building in Iloilo City which was completed in 1934. Almost 85 years later, the building which is now owned by the Villanueva family still stand today and has been restored in the past couple of years. In addition to shipping and real estate, Jaime was listed as a founding shareholder of United New San Remigio Mining Co. (mining for gold, silver and copper) in 1938 alongside other merchants such as Jose Javellana, Jose Marquez-Lim (father in law of industrialist Emerson Coseteng and maternal grandfather of politician Nikki Coseteng), Jovito Co, Co Sian-kee and others. 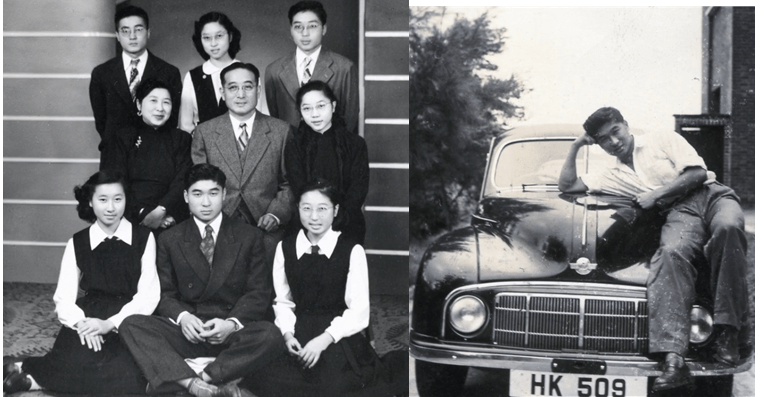 In the spring of 1938, the Tiampofamily moved from the Philippines to Hong Kong. It is unclear as to what prompted the Tiampos to make the move but many overseas Chinese were keen on setting up businesses in HK at the time to support the wartime Chinese economy and capital from the Philippines were also flowing into the British colony (two examples are J.H. Marsman and L.R. Nielsen who established mines in HK around the same time, see articles). In HK, the Tiampos were close to Father Carmelo Orlando (1907-1979), a priest from Sicily who worked at the St Teresa’s Church in Kowloon from 1935 to 1965. Leveraging their connections to the Catholic Church, the Tiampos purchased a parcel of land on Nathan Road from the Dominican Order of Priests and on it they built a U-shaped shopping center -Chungking Arcade (重慶市場), which was named after the wartime capital of China at the time.The center, which opened in 1941 (some source cite 1920 as the date when the Arcade was built but more sources cite 1941 as the date which makes more sense as Chungking did not become the nation’s capital until November 1937), contained 30 shops selling a variety of goods catering to tourists. It included a bar named Henry’s Café, operated by Henry Lowcock(father of DBS headmaster S.J. Lowcock and brother in law of Sir Robert Kotewall) and his wife Mabel which was popular with British servicemen. During the Japanese occupation, the Tiampos stayed in Hong Kong (living in Kowloon Tong based on the letter shown above) and the Chungking Arcade was renamed “Chung Hing Arcade” (中興市場). 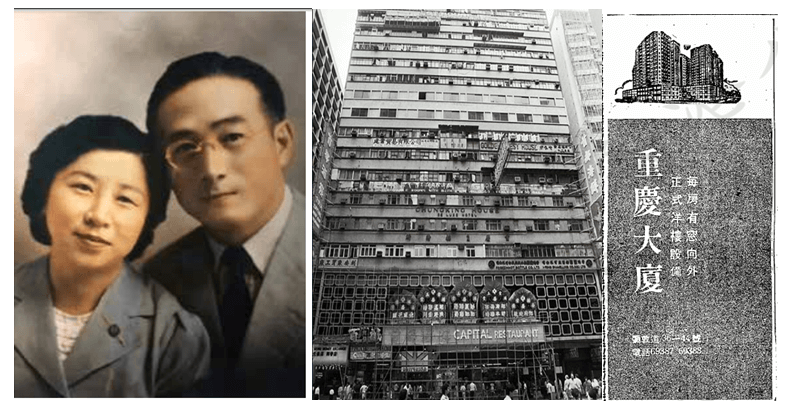 In 1944, Allied bombers dropped two bombs on the Arcade, one of which exploded and the other one which weighed over 500 pounds was buried and not uncovered until the construction of Chungking Mansion in 1959 fifteen years later. After the War, the Tiampos re-opened the Chungking Arcade which grew to over 50 shops ranging from tailor shops, silk and ivory stores to bars that were popular with visiting tourists and sailors. By the late 1950s, Tsim Sha Tsui was quickly developing into a shopping destination with the section where the Arcade was located on Nathan Road becoming known as the “Golden Mile”. Hotels and high-rise buildings were being developed up and down the street so Jaime Chua Tiampo decided to re-developthe Chungking Arcade into a shopping, residential and hotel complex, retaining the name of Chungking. The plans for re-development of the Arcade began as early as June 1956 when the Arcade sent one-month eviction notices to its 50 tenants, but the effort was not successful. 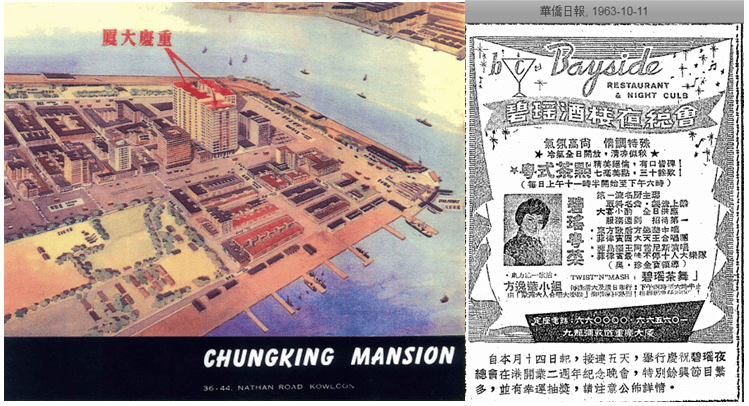 In March 1958, Jaime took the case to the Tenancy Tribunal and after 2 months of trials with Jaime represented by Patrick Yu and the 46 tenants represented by Brook Bernacchi and further discussions in the High Court, the project was greenlighted with Jaime ordered to pay HK$1.23 million in compensation to the Arcade’s tenants, required to show his financial ability within 6 months and build two blocksof high-rise (one 11-story tall and another 17-story tall) as he had proposed (he had changed his plans to re-develop the Arcade into three-story buildings at one point)within two years. The projected construction cost was HK$7 million and according to an online tribute to Jaime’s son Tony Tiampo, the family was unable to secure a bank loan large enough to finance the whole project because of its scale (other article mentioned Bank of East Asia was able to provide $1.5 million in loans) so Josefina and Tony pre-sold many units to Filipino investors in the Philippines through the stock brokerage they operated there and was able to raise the funding within three months. Eventually the project’s scale expanded from two blocks to five blocks (A through E) with 17 floors each and the hotel part was scrapped (but of course many guesthouses popped up in the building over time). 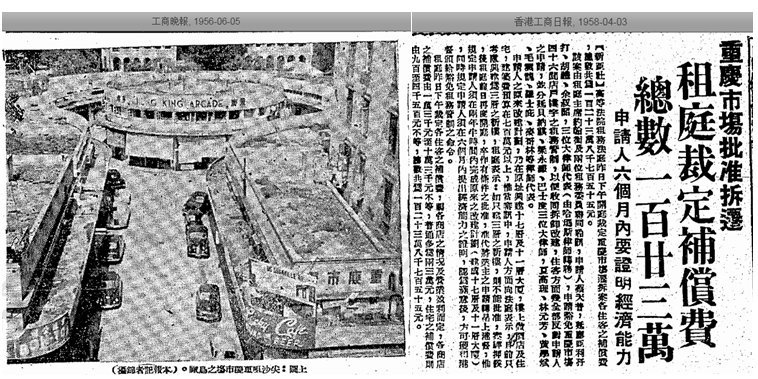 Construction took place between 1959 and 1961 and 549 domestic units of 1000 square feet were sold at the price of HK$30,000 each, bringing in over HK$16 mil. The residential section of the building was completed in November 1961 while the three-story shopping arcade on the first three floors opened in May 1962 to great fanfare. Also known as the “HK Shopping Mart”, it was touted as the largest shopping center in Hong Kong with over 100 shops. At the time, the building with its 70 parking spaces and harbor view was one of the more desirable properties in Hong Kong and most of the occupants in the early years were Chinese including I-Feng Enameling and Freezinhot Vacuum Flask Factory (see articles) which occupied the 3rd floor as their headquarters. In late 1962, the Bayside Restaurant & Nightclub (新碧瑤) opened in the basement of the Chungking Mansion which very quickly became a popular nightspot in HK in the 1960s. The proprietor Dr. Salvador R. Samson was the nightclub king of the Philippines who operated a top nightspot with the same name in Manila – it is likely that Samson knew the Tiampos from the Philippines. The restaurant of the Bayside served Cantonese dim sum and Italian food while the entertainment featured local acts such as the Fabulous Echoes, the Kontinentals, Mona Fong and the GeneOcampo jazz quintet. In the early 1970s, Tung Wan Kok (東雲閣) was another famous nightclub which operated in the basement of the Mansions featuring future Cantopop stars such as Kenny Bee and Susanna Kwan (關菊英) and the club was controlled by Fung Kau (馮九), the bribe collector for the corrupt police sergeant Lui Lok (who allegedly operated out of the 6th floor of the building)and Barbara Lau, who was shareholder of a company which owned two floors in Block A (9th and 10th , later sold to Sam Kwong Weaving and left empty for the past four decades). Over time, Chung King Mansions suffered many fires (first major one in 1966 which destroyed six shops in the arcade and resulted in over HK$3 million in damages) and transformed from a high-end residential development into fascinatingcollection of low-budget guesthouses, shops and restaurants which has attracted all types of visitors from 120 nationalities and captured the attention of journalists, anthropologists and filmmakers from all over the world. Although the residential units of the Chungking Mansions were sold, the Tiampos kept many of the shop units and according to court documents, the management of the Chungking Mansions was handled by the Tiampo family until 1972 when the Incorporated Owners of Chungking Mansions was formed (with Lui Lok’s lieutenant Fung Kau serving as chairman for the first four terms) and the family maintained its influence in the building until 1976/1977. In 1986, the Tiampo family sold 20 shop units on the ground and 1st floor of the shopping arcade, 11 units on the upper floors and three main roofs of Block A of the building to Murli PessumalShamdasani, an Indian merchant who had operated various businesses in the building in spaces leased from the Tiampos since the early 1970s. Jaime and Josefina had three sons and four daughters, 5 of whom settled in Canada and 2 in the US starting in the 1960s. The couple themselves moved to Vancouver, Canada in 1970 where they accumulated substantial property and land holdings in British Columbia via Amon Lands Ltd and Amon Investments Ltd, including the purchase of 1855 acres of land in Squamish Valley from timber giant Rayonier in 1972 for under $2 million. Josefina died in June 1979 followed by Jaime who passed away ten months later in April 1980. The couple’s eldest son Leoncio (“Leon”) Chua Tiampo attended HKU where he was an athletic champion, worked for the family business in the Philippines and was later in charge of Amon in Canada. The second son Clemente (“Clem”) Chua Tiampo (1928-) studied at the Catholic University in Peiping (now Beijing) and graduated from Harvard Business School in 1953. He entered the investment field in the US and by 1966 was elected a director of the mutual fund giant Capital Research. In memory of his parents, Clem endowed the Jaime & Josefina Chua Tiampo Professorship at Harvard Business School in 1983. The third son Antonio (“Tony”) Chua Tiampo (1931-2015) graduated from Seattle University with a B.S. in economics in 1953 and worked in the Philippines from 1955 to 1960 for the family brokerage before moving to HK in 1960 where he managed the Chungking Mansions until the 1970s when he moved to Canada. Tony was involved with the Rotary Club of Kowloon and the Rotary Club of Vancouver Chinatown. The 4 daughters are Helen, Teresita, Rosa and Josette. Josette’s husband Jose Bun-keeKhu (1920-2012) was a fellow Filipino Chinese who was an active leader of the Chinese community in Calgary, Canada from the 1970s to 1990s. The next generations include 21 grandchildren (Ming Tiampo, professor of art history at Carleton University is one) and at least 16 great grandchildren. This article was first posted on 25th January 2019.